Kyoto resident Nils Ferry is a popular guy... in fact, he's married about 2,700 women. Only one is actually his wife, with the rest marrying other guys in ceremonies that he's “officiated” as a “minister” over the years. 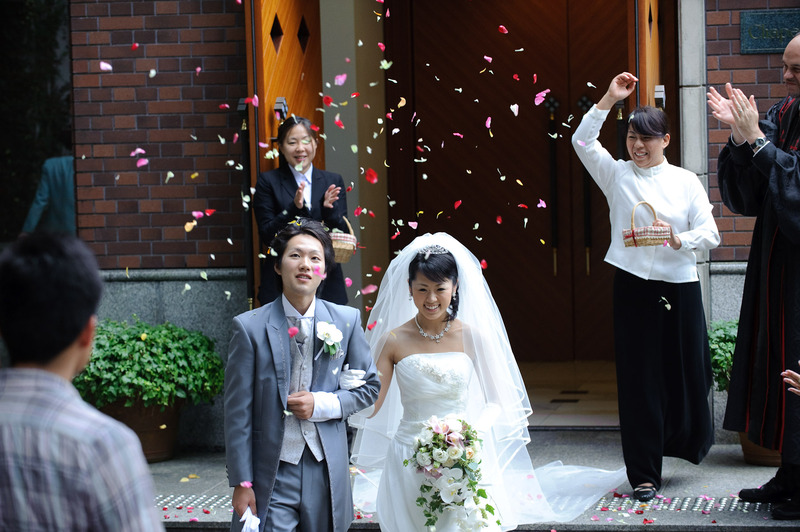 Most Japanese weddings are complex affairs, usually involving three steps: 1) a visit to a temple or shrine, with only the most immediate family involved, followed by 2) a short ceremony in a fake wedding chapel, followed by 3) a big reception with lots of guests, speeches, and alcohol. A large hotel usually handles steps #2 and #3, and offer the couple an endless array of packages and options. Besides the standard items familiar to westerners (e.g. how many guests, what kind of food), the couple picks a ceremony. Western or Japanese? American or European? Gospel or Bach? Trumpet or Violin? 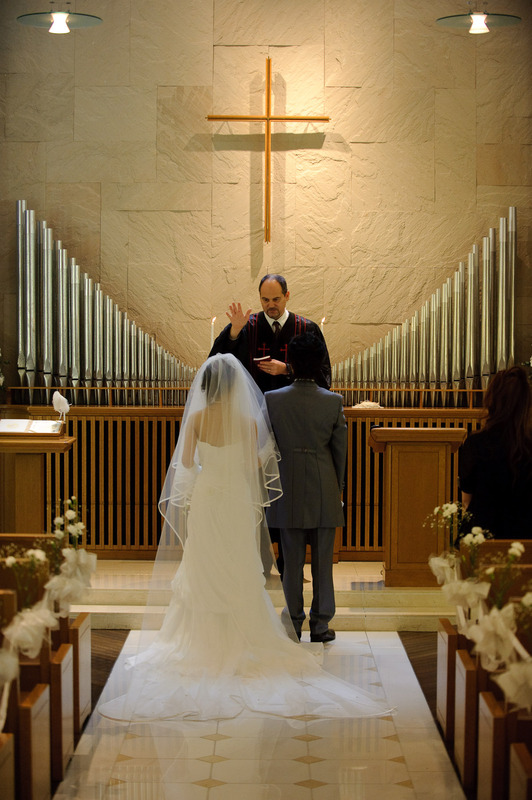 Couple enter together or bride given away by father? Etc., etc. 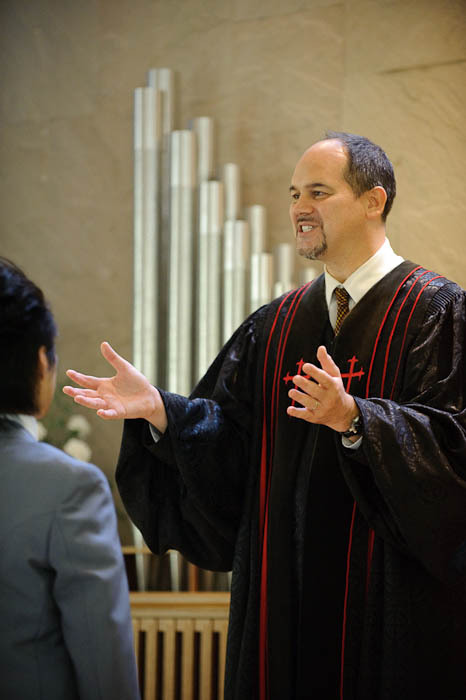 The “Western” option generally provides for a Christian-esque ceremony, and Nils' job is to play the part of the minister. 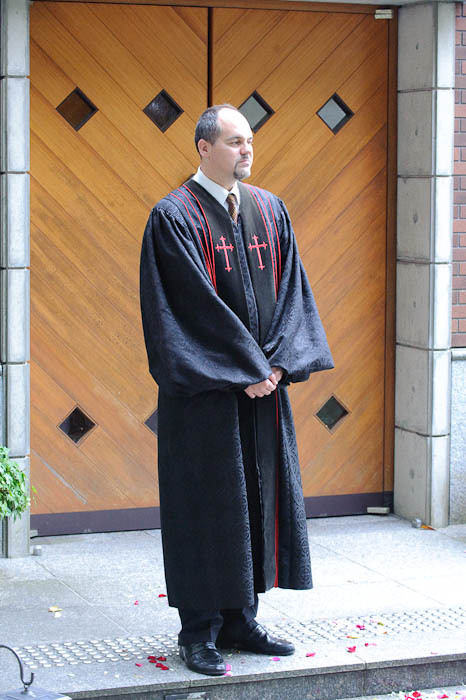 Much taller than me (and I'm 6'4"), he cuts an imposing figure decked out in his robe, but adopts the gracious and warmhearted impression of a Man of the Cloth. (In real life he is gracious and warmhearted, so it's not a difficult task.) 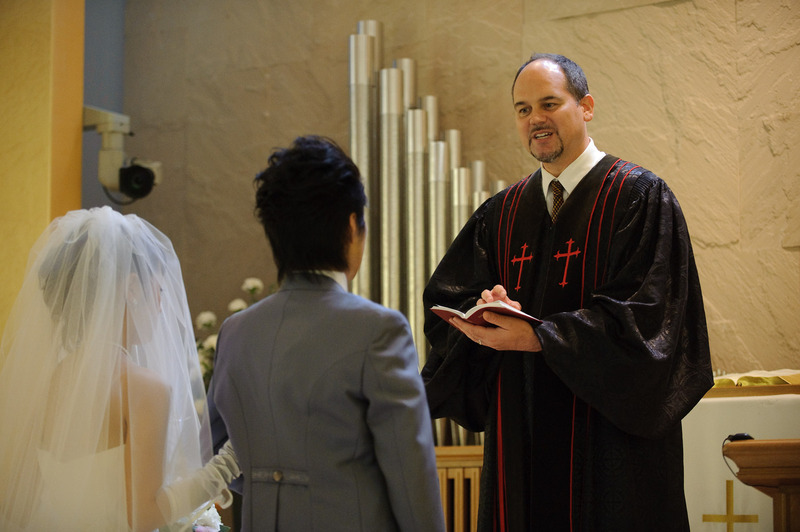 In his script he recites from the Bible in both Japanese and English, generally imploring and extolling the power of love to unite the couple through eternity. It's a mini version of a real Christian wedding, with all the touch points like a grand entrance to Here comes the Bride, an exchange of vows, rings, and a “you may kiss the bride”. Twenty minutes from start to finish. I sometimes use the word “fake” to describe this ceremony, but that's unfair. Much of Japanese culture was originally rooted in religion, but over time has become simply culture for most, in the same way non-Christians in The West might still exchange presents on December 25th. This kind of “fake” Christian wedding ceremony is a modern invention in Japan, but cut from the same “religion as culture” cloth. 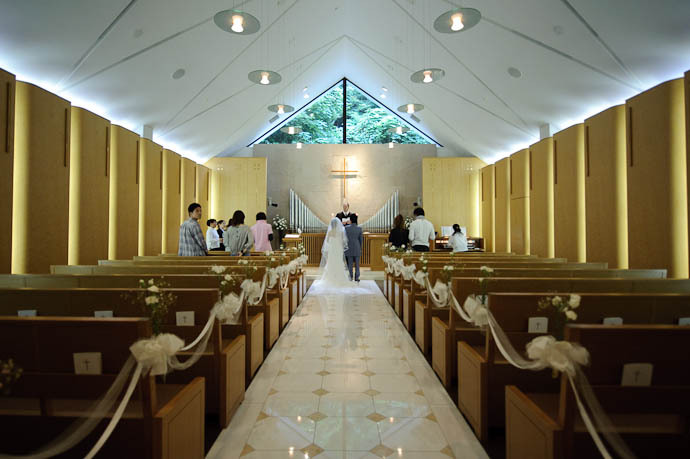 That being said, today's ceremony really was fake, because it was a demonstration for prospective couples considering having their wedding at the Westin Miyako, widely regarded as the premier hotel in Kyoto. The bride and groom were hotel staff wrangled to play the part, while others (Nils as the minister, an organist, a singer, and a trumpet player) were from an agency that has a contract with the hotel. I visit with Nils every so often, to let our kids play together or to go on a photo hunt in some corner of Kyoto or another (most recently a couple of weeks ago to Rengeji Temple), but today was the first I've been able to accept his invitation to see him at work. The lady throwing the rose pedals is a singer belonging to the same agency as Nils. She sang Ave Maria and was simply stunning. It brought me back to my own wedding 11+ years ago (also in Kyoto, but at a real Catholic church) because we also had Ave Maria sung. When I first moved to Kyoto in 2004, Nils was the premier Kyoto photo-blogger. However, an eventual byproduct of the first woman he married (his wife) resulted in him becoming a daddy, and with that, his blogging output declined considerably. Greg will start first grade next year, and so perhaps Nils will have time to get back into photo-blogging Kyoto. That is one of the most bizarre things I’ve seen about Japan. 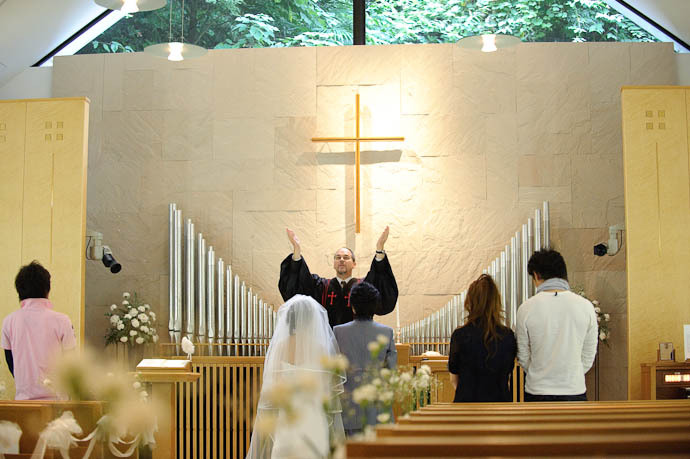 I feel sad that they diluted their own culture so much over the years that all is left now is this mix of Western and neo-Japanese “culture”, such as these fake Christian weddings. It’s one of the symptoms of the identity crisis Japan has been having pretty much since the end of WWII. It’s taking an extreme turn for the newer generation. Kind of reminds me of why manga characters have such large eyes, or why so many women have eye surgery. Sure doesn’t look Japanese to me. More like some sort of complex. If you are looking to drive away visitors, yeah, just keep posting pictures of me. I hope they aren’t deleting their bookmarks to your site. 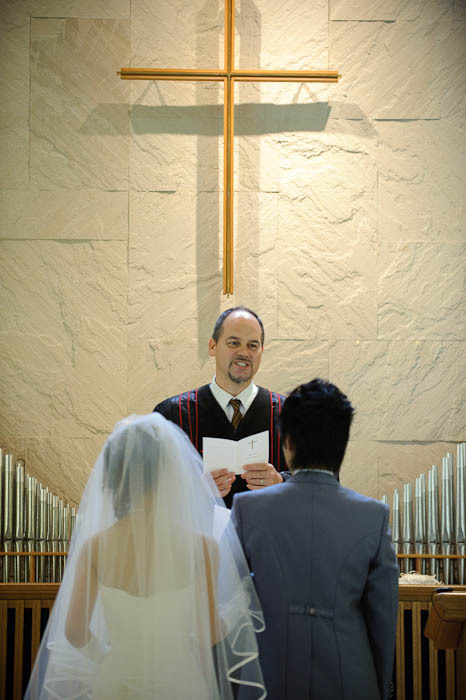 You did a good job, especially capturing the translucent veil. Delicate work, I’m impressed. All you have to do is memorize the patterns of the various ceremonies (so you can be in the right spot ahead of time for each part of the ceremony) and the list of must-get shots and you can start applying at wedding photography agencies. The singer who performed solo that day, Ukai Noriko, is a veteran of the stage with a lot of power to spare. Also, she’s from a small village in the mountains of Shiga that is famous as a ninja training center in years past, Koga. The site I was talking about the other day, Metafilter, has a post you might like today about a huge Anglo-Saxon gold treasure hoard found with a metal detector in England. My latest contribution was just a few days ago. Seeing the photograph of Nils I am struck by the similarity between his being and the young couple (the couple as actors). They are all foreign, to the ceremony except for Nils who could well be doing this somewhere in North America. I have therefore have questions for both Nils and Jeffrey. homeland to live sometime in the future? I assume that’s the United States. How difficult was it it to learn to speak, read and write the Japanese language? Coming from a primarily English speaking country? No, I came intending to stay for only one year, in 1994. Japan because I had some interest in Japan, had taken J language and lit classes in university, and foremost because my father had always recommended Japan for me, specifically. He was here in the immediate postwar GHQ years under MacArthur, a communications technology engineer. >And would either of you return to your homeland to live sometime in the future? >I assume that’s the United States. If the circumstances were right, yes. NO dual citizenship for adults, as Jeffrey wrote. Not a work permit as such, but a spouse visa, which allows pretty much any kind of non-governmental work. >How difficult was it it to learn to speak, read and write the Japanese language? How difficult? What kind of answer are you looking for? 42.